What would you do if you discovered the cure for asthma? 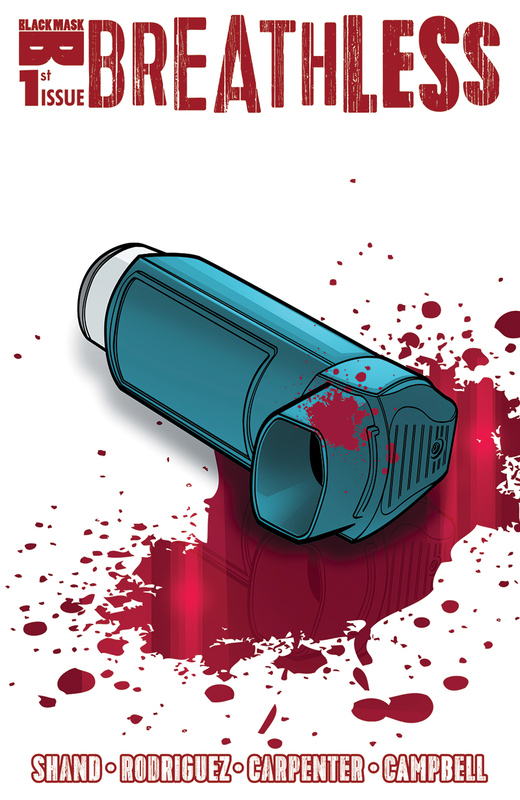 Breathless #1, a new healthcare horror story from Pat Shand (Destiny NY, Guardians of the Galaxy), follows Scout Turner, a cryptozoologist at Sweet Hollow Laboratories, who also has asthma. Scout’s job is to analyze and record information on supernatural monsters in order to gain more knowledge on them. The comic opens up with Scout dissecting a monster called the Hisser. With her asthma inhaler busted, she struggles to dissect the monster as the horrible smell coming from the dead monster irritates her asthma. Not being able to contain herself, her hand slips and she accidentally cuts into the rib-cage of the monster, releasing a vapor that she inevitably breathes in, which cures her asthma instantly. Once word got out, she became a target by a massive pharmaceutical company who makes the majority of its money from prescription drugs. What lengths will they go to stop her? The characters are well done and complement each other. Scout is a hard worker who can be a little rough around the edges sometimes, but her assistant, Grace-Eisley, is the complete opposite. She is a perky and overly talkative person who sometimes talks more than she works. Scout’s aunt Melissa is my favorite character. She is an elderly woman who has a good sense of humor and is very entertaining. I wish she had a bigger role to play, as she only appeared in a couple pages, but hopefully she will have a larger role in the next issue to come. Another minor character who I wish had more time in this comic is Farren, a succubus who is friends with Scout, proving that humans are also monsters in this world. The illustrations by Renzo Rodriguez (Hellchild) are amazing, and the coloring by Mara Jayne Carpenter (Jade Street Protection Services) is utter perfection. The colors are rich and vibrant, the death scenes have exquisite attention to detail, and the fighting scenes are epic. The rendering of the monsters are like characters from Stranger Things. I’m hoping that there will be more action with the monsters in the future. This comic has special meaning for creator Pat Shand as his own asthma prescription medicine is extremely expensive, just like the main character. This comic is meant to tell that kind of a story. A story that lets others know that there are people in the world who have to pay to breathe, but what’s more, pay to exist. He incorporated a lot of his own personal feelings of dislike for the big pharmaceutical companies and the disappointment in our system into Scout’s character. This comic wasn’t meant to lecture anyone, but instead to enlighten. I recommend this comic to anyone who loves action, thriller and sci-fi. Breathless #1 is out now.